In April this year (1999), the Hong Kong Deyin Qin SocietyT2 gave a guqin concert at the Shanghai Conservatory of Music. The first distinguishing feature of the performance was that most performers played qins they had crafted themselves; second, that most qins played used silk strings; third, that all performers wore traditional cheongsam or qipao on the stage. The spectacle reminded one of concerts before Liberation. The concert inspired two polarized reactions: some in the audience, touched, felt that this was the true style of guqin and that only after attending the concert had they realized that the tradition of guqin persists; others thought that wearing cheongsams and playing with silk strings no longer suited this era, as guqin ought to follow the progression of our time, thus playing this way constituted prosaic inflexibility. These opinion gaps can lead to debate, but it's perfectly normal. As an art, guqin has developed various styles to which individuals react differently due to their different preferences. Those who enjoy this style of performance can praise it while others who dislike it can still comment. The more variation there is in style and schools, the more the art of guqin appears rich and diverse. Guqin strings have historically been made of real silk. Since Mr. Wu Jinglue, in cooperation with an instrument factory (ed: during the Cultural Revolution, 1966 - 1976), developed steel-nylon strings, these metal strings have essentially replaced silk strings except for a small fraction of players. After the appearance of metal strings, the playing style of guqin has, in volume, quality of sound, technique as well as format of performance, departed from the old silk-string tradition. The evolution of a distinct style as a result of a change in string material is a process in the progression of guqin history. The appearance of metal strings has its own historical causes; we, prompted by the change in strings, will explore guqin's past, present, and future directions of progress. Before the Song dynasty qin strings were mostly produced by qin players themselves.T3 After the Ming, commercial strings became prevalent. The large number of brands implies a large discrepancy in quality. Throughout Ming and Qing, the best strings were made at the Huihui Tang in Hangzhou.T4 Its first generation, under Li Shiying, began to produce guqin strings as early as the Ming dynasty; its strings, named "ice strings" (bingxian),T5 were collected by the government for royal use. During the Qing Daoguang Emperor's reign (early 1800s), the ninth generation shop owner died without an heir and the original tradition of ice strings was lost. His students, Shen Yi of the Xiecheng Shop and Lu Wenrong of the Quanhe Shop, both continued to use Huihui Tang as a brand of string. Between the two, Shen's strings were superior to Lu's. After them, Heguangtang Store of Musical Instruments as well as Laosantai Makers also distributed strings using the Huihui Tang name.1 Though these various brands produced strings that lacked the superb quality of ice strings, they nevertheless provided qin players with high-quality strings. Prior to WWII, qinplayers in Jiangsu province could buy Huihui Tang strings in Shanghai. Then during the war, Shanghai qinplayers realized that Huihui Tang strings could no longer be found. Musicians Wu Jinglue and Zhuang Jiancheng went to Hangzhou to find craftsmen to produce strings but discovered that the string makers had shut down and there were no more craftsmen in Hangzhou who could produce silk strings. The strings sold in Shanghai were old inventory. The lack of strings became a problem in the qin field. Wu Jinglue and Zhuang Jiancheng thus found a craftsman, Fang Yuting （1885-1977）, in Suzhou. In cooperation, they experimented with traditional string-making methods in qin books and successfully resumed string production. For the few decades until steel strings came about, Fang Yuting remained the main string maker in the country. After Liberation, because silk was sold by the government centrally and could not be easily bought, and because silk strings required 3A grade silk, the production and supply of strings became problematic again. The efforts of Zha Fuxi solved the problem for a short period of time by persuading the government to provide top-grade silk. Eventually, however, the quality of silk lowered and Fang Yuting joined, in 1954, the Suzhou Production Cooperative, which individuals/organizations had to contact for ordering strings. Thus musicians could not discuss problems of standardization and quality directly with the craftsmen,2 and it became even more difficult for qinstrings to have the required quality. It was not possible to keep the standards from deteriorating more. It was not until the '70s, when Wu Jinglue developed nylon/steel strings, that the dilemma of low string supply was alleviated, but the true issue of silk strings has not been solved. Because most people have switched to metal strings, the demand for silk strings has dramatically decreased, driving silk strings to the verge of extinction once more. After the 1985 National Dapu Conference in Yangzhou, Shanghai musician Lin Youren accompanied Liu Chuhua and myself to the Suzhou National Musical Instruments Factory to try to persuade them to produce silk strings of higher quality. The response from the head of the factory was that if demand continued to decrease, production would be discontinued. We were worried and decided, upon returning to Hong Kong, to continuously go to musical instrument stores to ask for silk strings so that the stores would continue to order strings from Suzhou. Although the quality and supply both varied, production has not stopped entirely. Durability. A set of steel strings can be used for a long time, as they are less likely to break, and are therefore more economical. Consistency. Steel strings are less prone to going out of tune as a result of changes in temperature and humidity. This makes them especially fit for performance on a modern stage. Greater volume. This allows the qinto be performed in a larger area for a larger audience as well as giving it more opportunities to be played with other instruments. Bright timbre. It is more commonly accepted and thus beneficial to universalizing guqin. Smoothness. Sliding one's finger across the string thus becomes less noisy as well as less painful for beginners. The use of industrial products as materials for making steel strings maintains stability in supply, quality and production, preventing gaps in supply. As modern machine-made industrial products replace handicraft, traditional craftwork has declined around the world. Thus the appearance of steel strings, especially considering its applicability to modern performances, was inevitable. One issue steel strings still has not solved, however, is its timbre. The metallic noise of steel strings remains too strong, losing much of qin's original musical nuance.T7 This can be explained in two ways. Steel strings' metallic noise is too strong and its sustain too long, resulting in excessive sound. Sometimes the loud volume effects a loss in appeal, robbing guqin of its ancient, rich yet simple tone.4 Traditionally, players believed that the nuances in tone are the most important part of playing guqin. If one can hear zheng- or pipa-like sounds from a qin, the quality of playing plummets.5 Some players, historically, have used babao lacquerT8 in order to emphasize a distinct sharp sound, but this differs from metallic noise. Some guqins with steel strings can sound like a guitar. I have asked many qin players who have played with silk strings and most of them agree that silk strings carry a superior timbre in comparison to steel strings. When he lived, Mr. Wu Zhaoji believed as well that metal strings should only be used when one has no choice. Thus he used a pianfeng style (striking the string at an angle so that the right half rather than the middle of one's fingertip touches the string) to ameliorate the strong metallic noise. This method, however, is a compromise applicable only when one plays a stopped sound; the metallic noise cannot be reduced when playing an open note. If the open note induces noise from longitudinal vibration, the problem becomes more difficult to control. The best example is playing (the gunfus in the melody) Liu Shui (Flowing Streams) with metal strings, which often results in a series of noises similar to knocking on iron. For those who enjoy silk strings, this flaw is unacceptable. Thus, many would prefer to bear with the many shortcomings of silk strings than to endure the sound of metal strings. Furthermore, the tactile sensation from sliding or swaying one's fingers on a silk string cannot be replaced by metal strings. The brief pain when one first begins learning ceases to be a problem after the first calluses disappear. Professional musicians of today's generation require consistency in the tuning of the instrument they use on stage, sufficient volume when playing in ensemble, bright tone as well as ease of tuning. When introducing a new composition, the strings must be fit for different requirements and special effecs. These are characteristics of metal strings that silk strings cannot replicate.T9 To a traditional amateur player, however, aside from requirements from onstage performance and playing ensemble, silk strings' flaws, as compared to metal strings, become negligible or even advantageous. The decline in silk string quality is caused by the decline in the original material as well as craftsmanship.6 When the silk is not twisted and coiled tightly enough, the string becomes loose and rough-surfaced, resulting in unpleasant noises.T10 If tuned up to standard pitch, the string becomes prone to breaking. This example demonstrates that the noises from silk strings can be overcome through skill and developed into one's unique style. "(Cheng Hongyu): Recently listening to the newly published set of eight (CDs containing documentary) recordings, I heard Guan Pinghu performing his reconstructions of Guangling San, Li Sao (see Vol. 1) and Ai NaiT12 (see Vol. 4); his firm, powerful style, rarely found in today's artists, seems to reflect the essence of ancient times, but I can't explain why.... (Cheng Gongliang): I feel the same way. These eight CDs have recordings made in the 1950's and represent the era of Guan Pinghu, Zha Fuxi and Yao Bingyan. In Beijing at the beginning of last April (in 1994), during the International Conference for Appreciating Guqin and its Music, recordings were made that were published as four more CDs.T13 Although all four contained performances with qins from Tang, Song, Ming or Qing eras that have been passed down through generations, these qins used steel-nylon strings and their tone could not compare with the traditional, unadorned feel of the older records. This refers to the change in strings. What of performance skills? The depth and substance pale in comparison to the earlier artists. School characteristics and personal style are also less vigorous...."
These two examples illustrate that the switch in qin strings has altered the style of the art of guqin. These changes have both advantages and flaws. Advantages mainly lie in the reduction of unwanted noise, which is physical and technological in nature. The most significant flaw is the thinning of (musical) substance, which is artistic in nature. Although the change in strings isn't the sole cause, it constitutes an important cause. Technological and physical issues can be solved easily; artistic issues are more difficult to resolve. Although supporters of silk strings occupy a minority, their determination in even the worst environment supports the fact that silk strings indeed have their own appeal. The most representative example is the American musician John Thompson, who resides in Hong Kong. Resolute in his passion for silk strings, he has translated the Taiyin Daquanji's string-making procedure into English and published it on his website9 along with his personal thoughts regarding silk strings, exchanging knowledge and sharing experiences with qinplayers around the world. In Vancouver, Canada, I have met a physicist named Evert Koster from the University of British Columbia.10 Through the internet, he has communicated with Thompson, even dissecting silk strings to analyze their filament structure. This demonstrates a widespread support for lovers of silk strings, who have shown an increasing trend in the recent years. Last year, John Thompson and Liu Chuhua each released a recording performed with silk string qins. Hong Kong musician Mr. Sou Sitai will soon be releasing his own recording as well. I believe that if silk strings could rise in quality, there would be more players using silk strings. At the same time, if demand increased, the quality would be lifted as well, a result of common market trends. This is much like guqin itself. Over the past twenty years, because demand has increased, more and more guqin makers have appeared, some factories and some individuals, which is common knowledge to all qinplayers. Hopefully strings will go through the same in the future. All qinplayers wish for a good qin, and thus pursue relentlessly a qin they find preferable. Regardless of whether it's old or new, qinplayers' first requirement for a qin is excellence of sound. Even a qin that excels in all nine standards, however, can only produce inferior sound if the strings are inadequate, which has become a serious drawback. Both silk and metal strings, as of now, are flawed in many ways. This string issue has bothered the guqin field for more than one or two generations. Our predecessors, especially musicians such as Wu Jinglue, Zhuang Jiancheng, Zha Fuxi and Fang Yuting, have all had to face and resolve string-supply crises in their time. In the past twenty to thirty years, however, the availability of metal strings has solved the problem of string supply and we have not worked to enhance the quality of strings, for which we are responsible as qinplayers. To perform well, one must first elevate one's instrument. Thus, I believe that the improvement of strings ― whether of metal or silk ― is the foremost subject players must consider. Currently, the number of qin players is the highest since the qin's decline prior to mid-twentieth century. This is also the time of greatest economic development and improvement in living standards, which has led to a higher expectation for the status of art. With the advancement of industrial technology, the opportunity for strings that excel in both production and artistic quality has become more attainable than ever before. All conditions are optimal for improving qin strings; the only factor absent is the keenness of qin players. I believe that the improvement of qin strings ought to be approached from two directions: the enhancement of traditional silk strings and the design of new strings. Steel strings have already solved most flaws in qin strings and are popular among most players. Their most significant problems rest in the excessive metallic noise and longitudinal vibration. If this issue can be overcome, the bright, vigorous style of metallic strings would appeal even more. With a set of steel strings, one would be able to produce the historically cherished sharp tone of the babaohui-lacquered qin. The dilemma of excessive metallic sound can likely be resolved through varying the metal material, experimenting with different techniques for coiling the string and forming the core of the string, and referring to Western string-making theory and methods. That of noise produced by longitudinal vibration, according to Tse Chun-Yan's research, can be reduced through playing at different places and special treatment for the strings. To fully overcome this obstacle, one would have to alter the material and coiling technique. From written records, we can discover that, historically, improvement to guqin was often done through improving the instrument, the qin table or the environment in which one plays. Before the disappearance of ice strings, there were few special requirements for strings, possibly because the craft of string-making was more skillfully grasped, thus the quality of the strings was never an issue. Therefore, the first step to improving silk strings is more sophisticated research in traditional string-making procedures. Then, in cooperation with older craftsmen who still master the string-making process and focusing on material, craft, and standardization, we can at least return silk strings to Huihuitang quality, if not ice strings. Players can select appropriate strings based on the attributes of their qin, their personal style, the audience, the goal for performance, the sophistication of their art, the need of the melody, and so forth. Superior strings would be selected whereas inferior ones would be eliminated. As the 21st century approaches, the world rapidly develops toward more advanced technology while reconsidering traditional human culture. The excessive development of high-technology industries continuously disrupts the natural equilibrium while people fight for the protection of the environment. On the one hand, we constantly destroy traditional values and ideas; on the other, we revive traditional culture. Despite this apparent paradox, as long as a balance can be achieved, humans will continue to live in this world. The art of guqin, in modern society, must also find balance in development and retrospection in order to flourish. The arts are no revolution; their development needs not radicalism but constancy and ongoing accumulation, which possibly explains the survival of the art of guqin. Such is our confidence in guqin and Chinese culture at large. While writing these articles, Wong Shu-Chee was also performing an even more invaluable task by working with silk string makers to improve the quality of their strings. Some of this is discribed under Silk strings. One factor which these articles do not address is the damage metal strings can potentially cause to ancient instruments. This is also discussed under Silk strings. T2. The Deyin Qin Society was formed in Hong Kong by students of 蔡德允 Madame Tsar Teh-yun (Cai Deyun; 1905—2007). T3. Clarification neeeded on this point. 4797.36ff has various huihui terms, but not Huihui Tang. It literally means "Muslim Hall", and here it refers to Hangzhou's Phoenix Mosque (鳳凰寺 see Chinese webpage), also called 禮拜寺 Libai Si, one of Southeast China's "Four Great Mosques" (the other three are in 揚州 Yangzhou, 泉州 Quanzhou and 廣州 Guangzhou; China's northwest also has its own "Four Great Mosques"). 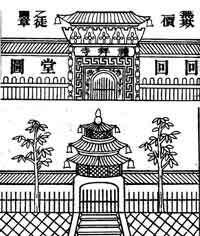 At right are two illustrations from Erxiang Qinpu (1833; XXIII/89, "Hangzhou strings") showing the front and back of Huihui Tang (the characters over the doorway are 禮拜寺 Libai Si). Compare this image to this one: see also below. These images clearly show the connection between the company and the temple. From at least the Tang dynasty Hangzhou was a major Muslim center, mainly because of sea trade with the Middle East. It was common for the Muslims to live and work in a community around or even within their mosque compounds. T6. This apparently refers to modern concert A = 440 Hz (vib/sec), enabling the qin to be played with the piano and other instruments tuned to this pitch. T7. The word used here, 韻味 yunwei, simultaneously implies lasting appeal, subtly distinctive timbre, and underlying, "greater" meaning and thus is difficult to translate. This is lacquer mixed with tiny fragments of gold, silver, pearl, jade, agate, coral, shells, etc. See http://www.wulin.hk/new_player/02.htm. T9. Needless to say, I disagree with this comment. It is indeed more complicated performing on stage with silk string, but if one has a quiet hall with good acoustics and, if necessary, a good amplification system, the qualities of silk strings can be conveyed quite as well as the qualities of metal strings. Solutions for this problem are discussed further in the main silk string article. A Bing (also Romanized Abing and Ah Bing) was a blind musician. It is interesting to compare him to the perhaps most famous early 20th century erhu player, 劉天華 Liu Tianhua (1895 - 1932). Liu Tianhua is considered to be the developer of the modern fluid erhu bowing technique. In this it is interesting to compare the changes during the 19th century in violin bowing technique (before the 19th century violin bowing was apparently less fluid). Jonathan Stock has written a book about Abing, Musical Creativity in Twentieth-Century China: Abing, His Music, and Its Changing Meanings. This title is said to represent the actual call of a fisherman. Apparently there are various ideas of how this actually sounded. Thus although it is standardly written 欸乃, it is pronounced "ao ai" as well as "ai nai". Wong Shu-Chee's article has 款乃, pronounced "kuan nai", which is another variation. The Chinese title is 中國古琴名琴名曲國際鑑賞會; the CDs were published in Taiwan with the title 中國古琴名家名曲, translated as The Eminent Pieces for Chinese Guqin (see listing). 2. Regarding the problem of qin strings during the period of the War Against Japan until the 1950s, one can examine two articles by Zha Fuxi in his Qinxue Wencui. One is "New Hatreds Piled on Old in the Production of Qin Strings" (琴絃生產之舊恨新愁 Qinxian Shengchan zhi Jiuhen Xinchou; p. 191); the other is "Problems with Qin Strings" (琴絃問題 Qinxian Wenti; p. 384). 3. Tse Chun-Yan, "Guqin Color and Longitudenal Vibrations" (古琴音色與琴絃之縱向振動), soon to be published by Beijing's Chinese Guqin Art Friendship Center in Seven-String Qin Musical Art (七絃琴音樂藝術; see Volume 5, October 1999, p. 29). 4. Concerning the physical results of artistic discrepancies brought out by the differences between the musical color of silk strings and metal strings, the Belgian guqin expert George Goormaghtigh living in Switzerland has done some clarifying analysis. See Georges Goormaghtigh's Appraisal of Qin Strings (? 琴絃揆敘 Qinxian Kuixu) recorded in Guqin Flourishing Jewel (? 古琴薈珍 Guqin Huizhen), Hong Kong University Art Museum publication, published in October 1998. 唐李肇，國史補 In the Tang dynasty Li Zhao's Guoshi Bu had a typical example: "Minister of Public Works Yu Di once ordered a guest to play the qin. His sister-in-law, who understood music, listened through a curtain. She said, 'Of the (music's) three parts, one part is the sound of a zheng zither, two parts are the sound of a pipa lute. It is completely not the sound of a qin.'" "Although the qin bridge is high the strings are low; (but) although the (strings) are low they don't hit against the surface (of the qin, i.e., they don't make extraneous buzzing noises?). If you press (the strings) down it is as though there is no string under the finger. When doing a vibrato, if excess sounds are produced then it is a zheng sound not from a Lei family product; this is completely unlike a qin sound." ([Wong's two quotes are] taken from Zheng Minzhong, "Analysis of the qin named 'Chun Lei' in the collection of the imperial palace treasury during the Xuanhe period (1119 - 1126) of the Song dynasty". 6. Since the death of Fang Yuting, the Suzhou Folk Instrument Factory basically changed to using machinery to manufacture qin strings; the basic silk used was also only B grade. 8. This essay (Chinese title "打譜是甚麼──與女兒、學生成紅雨的談話") was given to the author by Cheng Gongliang in 1995 at the International Conference on Art of the Chinese Guqin in Chengdu. 9. The relevant page on John Thompson's website is (now) http://www.silkqin.com/03qobj/silk.htm. Evert studied qin in Beijing with 趙家珍 Zhao Jiazhen (now a professor at the Central Conservatory. He is a fan of Chinese culture who has studied taijiquan for over ten years, and now the research assistant for the Vancouver, Canada, Taijiquan Association. He prefers playing with silk strings. Return to the top, or to the Guqin ToC.